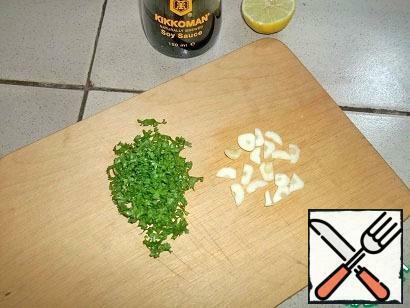 Another interesting, a bit exotic recipe. This time we will try Vietnamese cuisine. You can serve soup hot. I liked the cold option, refreshing, with a slight acidity and subtle fruity note - a great alternative to our okroshka on hot days. 200 gram Seafood white fish, shrimp, squid, etc. Necessary product. The beans I have cooked, but you can substitute canned, which has to be drained and rinsed. 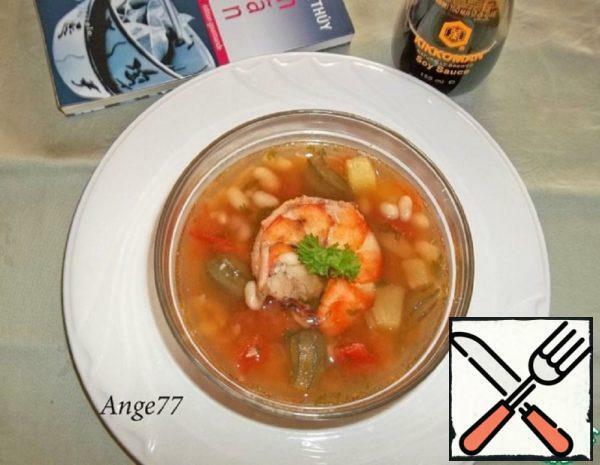 I'll cook soup with prawns (or rather one tiger shrimp, I have it big). You can take any seafood to your taste. Lime squeeze juice, you will need 1.5 tbsp of juice. Seafood pour 1 tbsp soy sauce, pepper and a little salt, leave for 15 minutes. 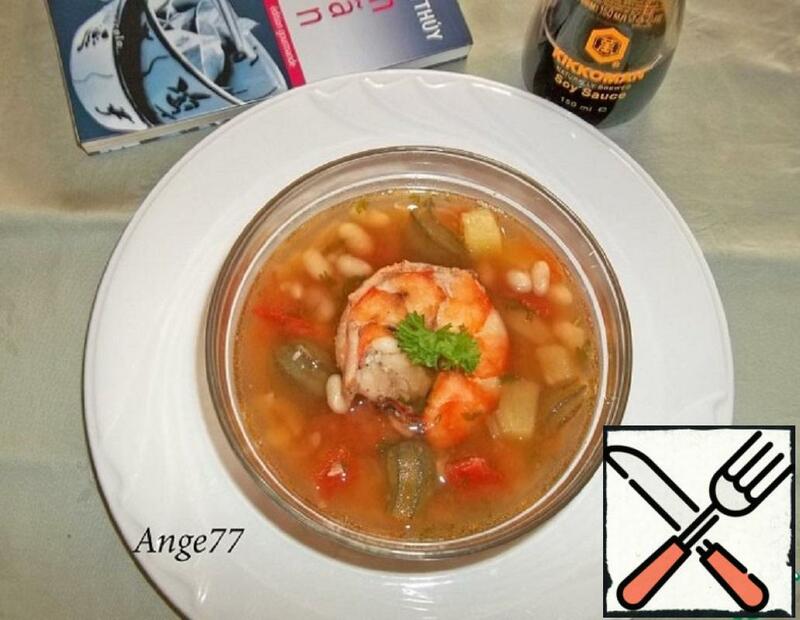 In a saucepan, boil water, add lime or lemon juice, lower the shrimp along with the marinade in boiling water. 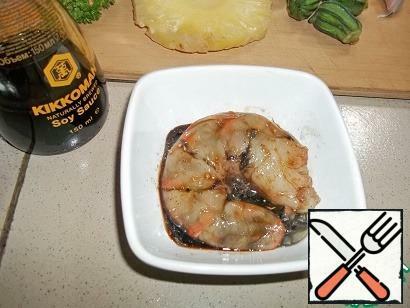 Reduce the heat and cook for 4-5 minutes (depending on the size of the shrimp, for small enough 2-3 minutes). If you take other seafood, then focus on the time and features of their preparation. 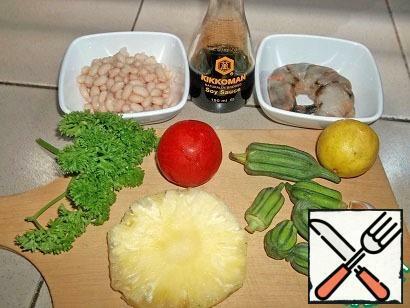 While seafood is marinated, okra (or as we call this vegetable "Gombo") cut along, removing the stalks. If the okra is large, cut into rings. 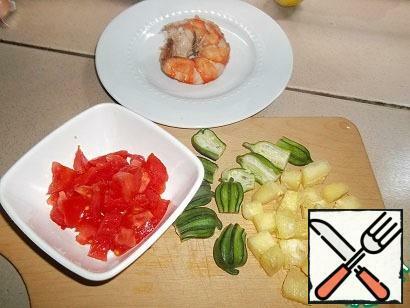 Pineapple and tomatoes cut into small cubes. 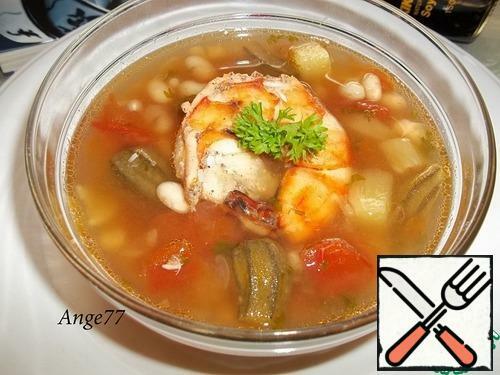 Get the seafood with a slotted spoon from the pan. 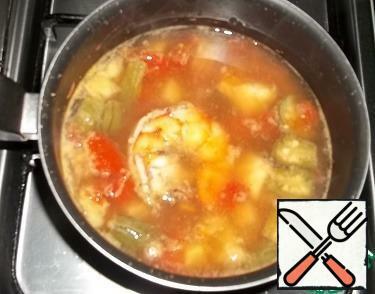 In the boiling broth add the prepared okra, pineapple and tomatoes. Cook over medium heat for 10 minutes. Lid not to close, run away. Fresh coriander or parsley finely chop, garlic cut as you like. Add to the soup greens, garlic, beans, a pinch of a mixture of peppers and coriander, 1 tbsp soy sauce. Only then try the salt. In the original recipe is taken fish Vietnamese sauce, which I boldly replaced with soy sauce. Cook for another 5 minutes. Add previously extracted seafood. Increase the heat and boil the soup for a minute. This is done.